^ Beck, Roger B.; Linda Black, Larry S. Krieger, Phillip C. Naylor, Dahia Ibo Shabaka, (1999). World History: Patterns of Interaction. Evanston, IL: McDougal Littell. ISBN 0-395-87274-X. OCLC 39762695. ^ Clay, Albert Tobias (1919). The Empire of the Amorites. Yale University Press. pp. 97. ^ "Hammurabi". Architect of the Capitol. በ2008-05-19 የተወሰደ. ^ "[[[:መለጠፊያ:SCOTUS URL]] Courtroom Friezes]". Supreme Court of the United States. በ2008-05-19 የተወሰደ. Arnold, Bill T. (2005). Who Were the Babylonians?. Brill Publishers. ISBN 9004130713. OCLC 225281611. .
Breasted, James Henry (2003). Ancient Time or a History of the Early World, Part 1. Kessinger Publishing. ISBN 0766149463. OCLC 69651827. .
DeBlois, Lukas (1997). An Introduction to the Ancient World. Routledge. ISBN 0415127734. OCLC 231710353. .
Van De Mieroop, Marc (2005). 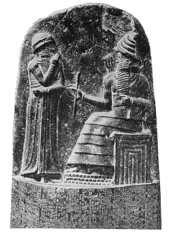 King Hammurabi of Babylon: A Biography. Blackwell Publishing. ISBN 1405126604. OCLC 255676990.